If you woke up this morning and felt a sharp pain in your mouth that wasn’t there the day before, your teeth could be experiencing problems. In this case, it’s most likely due to prolonged tooth decay. This can occur either from having a poor diet, not brushing and flossing regularly, or both. These are the most common reasons people experience tooth decay. If the problems become significant, you may even need to have your dentist in Estero extract the tooth entirely. However, it is usually their last resort compared to other treatment methods. If your tooth is in either of these conditions, your dentist will likely choose to extract them. If a tooth is only in the early stages of tooth decay, the dentist can usually treat and keep the tooth. This is done through a few different ways, such as using a tooth-colored filling placed with dental adhesive. They may also fabricate a crown to cover tooth decay if it’s more significant and they need to prevent the affected tooth from breaking apart further. However, in cases where the tooth experiences severe tooth decay, there’s a good chance that most of your original tooth structure has been too compromised for a simple filling or dental crown to treat. At that point, no restoration can prevent bacteria from entering your tooth pulp. If this happens, an infection could develop, and you put your mouth at greater risk. Another common case where extraction is needed is after the tooth has suffered a severe fracture. This typically occurs from an accident such as a sports injury or a very bad fall. In other cases, patients can be eating tough foods or even chewing too harshly when they feel their tooth crack. An extraction should only be considered if the crack reaches down into the pulp of the tooth. According to the American Association of Endodontists, a crack that extends below the gumline is a prime candidate for removal because it puts the pulp at risk of exposure to bacteria. How Long Is My Recovery Period? 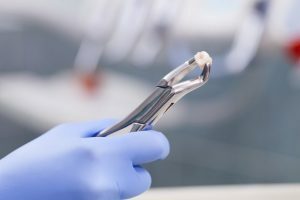 Like any oral surgery, a tooth extraction in Estero comes with a recovery period that requires close attention. On average it takes about two weeks for the surgery site to heal completely. After the initial removal, your dentist will have you bite on piece of gauze for up to 45 minutes to clot blood flow. For the next 24 hours, expect some light bleeding and a bit of facial swelling. To reduce inflammation, wrap an ice pack in a cloth and apply directly to your face. Stick to a diet of soft, cool foods to avoid irritating the extraction site. When brushing, be sure to be as gentle as possible around the area and if you smoke, avoid doing so for at least 5 days to avoid dry socket, a very painful condition. Not sure if your tooth needs to be extracted? Visit your dentist in Estero first to get professional advice! Dr. Rich Gilbert earned his DMD degree from the University of Florida College of Dentistry. Since then, he’s obtained a Fellowship in Implant Dentistry and a Mastership in General Dentistry, the highest honor offered from the Academy of General Dentistry. To learn more about his treatments for tooth extractions or about the practice, contact him at (239) 948-2111 or visit his website.